As a resident, the integration of these clinics has allowed me to learn from both naturopathic and conventional providers. I spend one day a week with Mark Ibsen, MD and his team at UCP where the focus is on conventional urgent care. Additionally, I spend one day a week with Jeff Roush, ND and two days a week with Nancy Aagenes, ND, both of Natural Medicine Plus. Dr. Roush has a primary care naturopathic practice serving men and women of all ages and Dr. Aagenes has a practice focused specifically on women’s health. The three days of the week that I spend immersed in naturopathic private practice has enabled me to strengthen my skills as a naturopathic clinician. I have gained experience in managing all levels of patient care from seeing patients in the office to taking phone calls and refilling medications. My clinical knowledge of naturopathic medicine has expanded tremendously by having access to Dr. Aagenes and Dr. Roush on a daily basis. Specifically, I have had the opportunity to address hormone balance and have become proficient in women’s wellness exams. I have also gained more experience with naturopathically managing mood and gastrointestinal issues, and a variety of other health conditions. 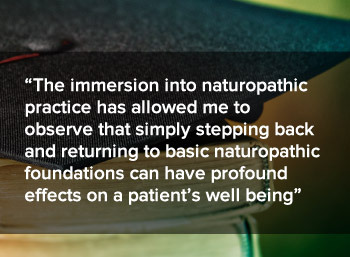 Finally, the immersion into naturopathic practice has allowed me to observe that simply stepping back and returning to basic naturopathic foundations (sleep, diet, exercise, spiritual connection, stress management) can have profound effects on a patient’s well being. Another benefit of my residency experience at Natural Medicine Plus is that I have had first hand experience with all aspects of maintaining a successful naturopathic clinic. From filling in on the front desk to sitting in on financial, marketing, and staff meetings, I have gained a better understanding of what it really takes to operate and manage a prosperous private practice. Participating in a residency in a naturopathic clinic that is closely connected to an urgent care has many advantages. I spent the first day of my residency at UCP with Dr. Mark Ibsen and we saw over 35 patients in 8 hours! My confidence and diagnostic skills have improved with the ability to see more patients. I have immediate access to diagnostic equipment including labs, x-rays, and ultrasound. Most interestingly, as a naturopathic resident, I have had the opportunity to directly collaborate with conventional providers. For example, a regular patient of NMP was seen at UCP, and the provider on the UCP floor requested that I sit in on the visit. When the time came to develop a plan, the UCP provider described conventional options, and I described naturopathic options. It led to a great conversation with the patient on the pros and cons of each plan, and ultimately she got to decide on the course. The patient appreciated this and both the UCP provider and I had the opportunity to learn more from each other. I also realized that regardless of the differences in our training and beliefs, we were mutually committed to what is best for the patient. My residency also included rotations with conventional providers in the greater Helena community. Bastyr University created an affiliation agreement with St. Peter’s Hospital, the local hospital in Helena, MT, allowing me to do rotations in dermatology, rheumatology, family medicine, oncology, ob/gyn, urgent care and psychiatry. Working with each conventional physician, I now better understand the broad spectrum of treatment options available to patients. I also have a clear understanding of how important a strong referral network is to a naturopathic practice in that it eases the patient’s navigation of the health care system and improves continuity of care. By far, the biggest lesson I have learned through my residency experience is that integration between conventional and naturopathic providers ultimately serves the patient by expanding their options for care and treatment. As an example, there have been several instances on my rotations with conventional providers in which their toolbox has reached its limit and providers have turned to me asking what is in my naturopathic medicine toolbox. This scenario could easily be reversed, as there are times as a naturopathic physician when my toolbox has reached its limits and a patient must seek an opinion from a conventional provider. That transition is made smoother when providers work together. Furthermore, integration and cooperation between conventional and naturopathic providers also serves patients in that it allows them to take control and make the best choices for their health and wellbeing. In preparation for a presentation to the AANP annual convention this year on the NMP/UCP clinic model, I was fortunate to have the opportunity to interview several patients who have utilized both NMP and UCP in various ways for their healthcare needs. Hearing each patient’s story, they remarked that they were more trusting of both naturopathic and conventional providers when the two work together. They also remarked that the freedom of choice allowed them to feel more in charge of their healthcare, and thus they felt more motivated to make positive changes in their habits and lifestyle. It is clear after my yearlong residency, patients want integration between naturopathic and conventional medicine. Working as a resident at Natural Medicine Plus and Urgent Care Plus has been an amazing experience. I would like to say a special thank you to my mentors who have been incredibly generous with their time, knowledge and support throughout this year including residency director, Nancy Aagenes, ND, residency faculty Jeff Roush, ND, and Mark Ibsen, MD, and to each of the providers in the Helena Community who extended preceptorship opportunities during my residency year. I also want to thank Integrative Therapeutics for providing funding for this residency year. It’s been absolutely incredible to work in a healthcare community in which integration occurs with a sense of ease. I know that this is certainly not the norm, but it could be. The ease of integration here in Helena is due to Dr. Aagenes’ steadfast commitment to create dialogue and positive relationships with conventional providers. As I move forward, it is my hope to continue to cultivate relationships with conventional providers in my naturopathic practice. In my residency training, I have been fortunate to witness that integration of naturopathic and conventional providers creates a rich experience allowing for a collaboration that promotes continued learning, broadens clinical toolboxes, expands choices and ultimately serves everyone from practitioner to patient. Dr. Hancock graduated from Bastyr University in June 2012. She fosters special interest in using counseling and energetic therapies with naturopathic medicine. She has advanced training in botanical medicine, craniosacral therapy, homeopathy, biotherapeutic drainage, biofeedback and counseling. As a student clinician she worked at the Tulalip Indian Health clinic serving the Tulalip Tribe in Washington.